As I recently posted on my Facebook page, we took down our “baby gate” this past weekend. We also finally stacked up our “baby barricade” and prepared to donate everything to a nearby city-run child-parent center. It’s the end of an era for our family. I remember first posting about the idea of a baby barricade or playpen, way back when my oldest daughter was becoming a mobile terror. The smiling bear stickers that adorned the walls of the barricade are long gone, sacrificial victims to an eager child’s exploring hands. But my kids loved these things. As they got older and the barricade lost its original purpose, we were able to use it for other things. A favorite usage was as a “house.” This was especially true on the weekends: the nursery school asks us to bring the kids’ nap-time futons home for cleaning, and while the outside covers are drying, there’s little to do with the inside actual futon components. So, presto, instant “ceiling” for a homemade playhouse with the baby barricade as the walls and doors. The barricade was also useful to cordon off a section of the first floor living room for lego blocks. Not 100% effective, of course, but even after the “barricade” aspect was no longer possible, the walls did serve to remind our kids that their playtoys had to stay within a certain space (more or less). We probably kept these devices much longer than we needed to, but in the end, they didn’t belong to us any more. They belonged to our kids. So we negotiated, telling them that the walls and gate were taking up too much room that could be used by other toys, games, drawings, and so forth. Ultimately, the decision was made by our kids to donate them so that other kids in the area could enjoy them, as they had. No need to throw away something so useful and so loved. And of course they served as a reminder that our kids are not getting any younger. Time has slipped past very fast, indeed. Only yesterday my daughter was a 10-month-old, unable to stand up without help and unable to express herself. Now both my kids are running around with glee, cheerfully roleplaying with stuffed animals, drawings, forks and spoons, half-deflated balloons and broken crayons, creating worlds of their own. There are no barriers, only new opportunities for self-exploration. 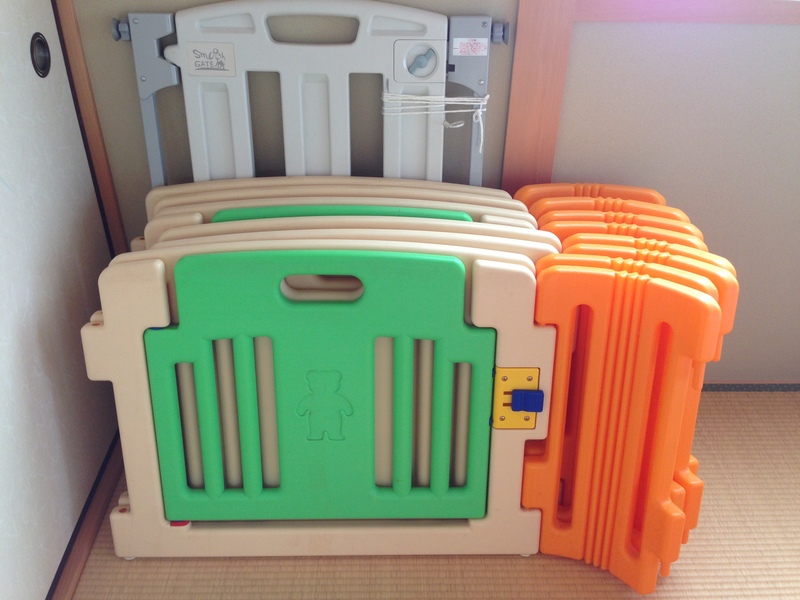 This entry was posted in baby toys, child safety, gate, play and tagged baby toys, child care, child safety, child-raising, children, creativity, Japan, Japanese kids, play. Bookmark the permalink.